So. Here’s the second installment of my pillow fight campaign. I just love this little lady, and she was so easy to put together. 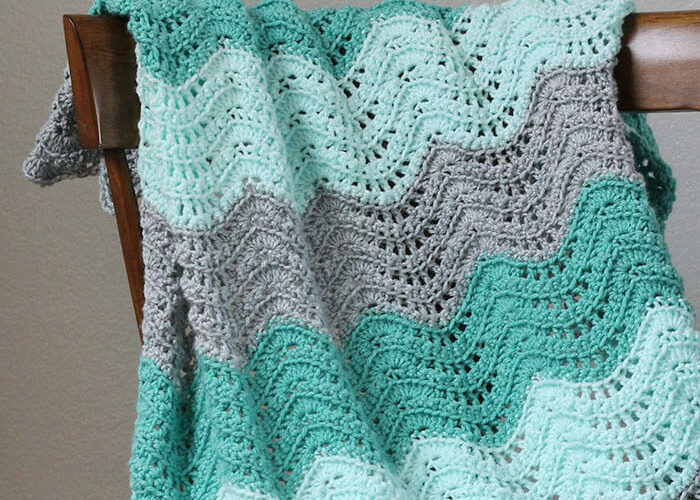 I love a quick, easy project with big impact. Don’t you? Start by stacking the two rectangles on top of each other so that the center line of the rectangles matches up. You could fold the rectangles in half and mark the center line to get it exactly, but I just eyeballed it. Next, sew along this center line using a long basting stitch (a 4 or 5 on your sewing machine). 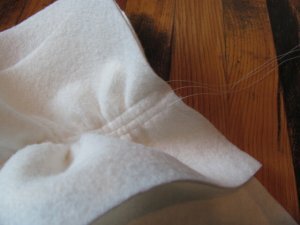 Once you have stitched down the center line, stitch another line of stitches on either side about a quarter of an inch away from the center line. This will give you a total of three lines of basting stitches running down the center of your rectangles (see the image below). 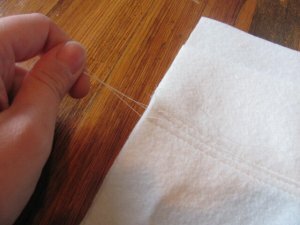 The three lines of stitches will make it easier for you to gather the thick fabric without breaking your threads. Now, you need to separate the top threads from the bobbin threads on the bottom. Once you have separated the top threads from the bottom threads, you will pull on just one set of threads (either the top or the bottom). As you pull on the threads, your rectangles will gather into a ruffle. 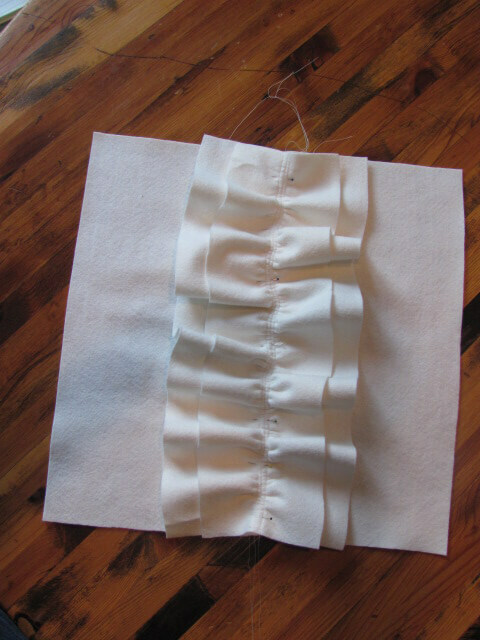 Use your fingers to move the fabric along your threads and evenly distribute your ruffles. Once your ruffles are 18 inches long (the length of the two squares), pin the ruffle to the center line of one of your two squares. 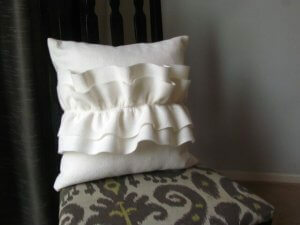 Sew the ruffle to the pillow along the center line of basting stitches using a basic stitch length (about a 2). Pin the two squares together with right sides facing, and sew three sides together leaving a 1/2 inch seam allowance. Clip the corners, and turn the pillow right side out (For more details and images of this step see this post). Stuff the pillow form into your case. 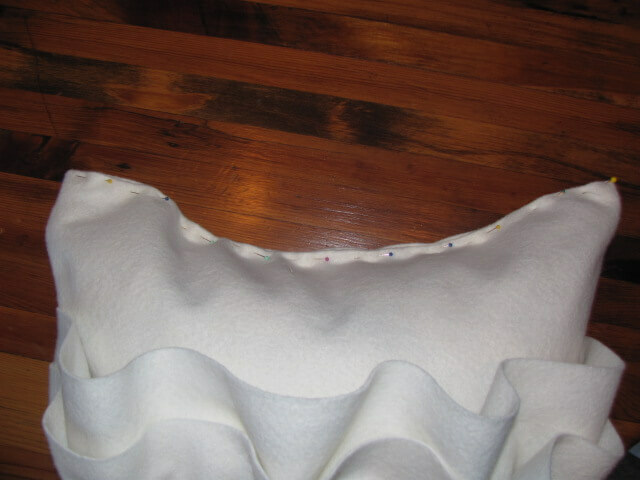 Fold over a half inch seam allowance on the open side, and pin together. Sew shut using a slip stitch. 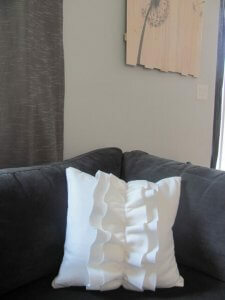 Enjoy your simple, pretty, ruffley pillow! 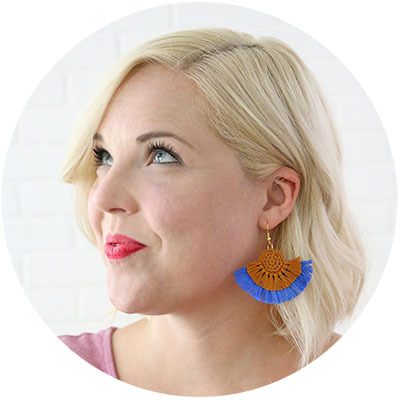 As soon as I clicked on this blog, I knew I was a goner. You are my crafty/interior design hero. That pillow is exactly what I&#39;ve been wanting to make for a long time but I didn&#39;t know how to sew ruffles, so THANK YOU for breaking it down for me! It&#39;s gorgeous! 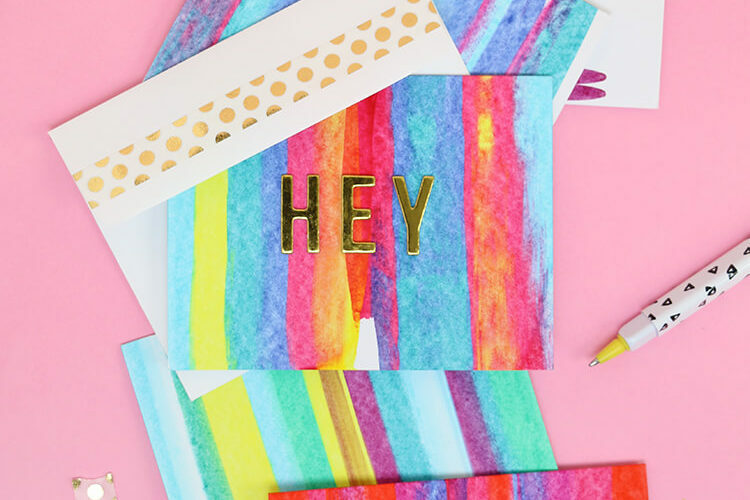 Thank you so much for the comments!<br /><br />Tara, I hope it is helpful! This is gorgeous! A perfect ruffle! I love it! Found you on Pinterest I&#39;m your newest follower stop by for a blog visit!